For centuries–maybe longer–Egyptians have been known as humorous. The tradition lives on. Shortly after Saad Ibrahim was sent to jail by the Mubarak regime on a trumped up charge intended to send a chill through the pro-democracy and human rights NGOs in the country, a bunch of us sat around in the Café Riche coffee house telling Saad Ibrahim stories. My favorite was about the time Saad was traveling in Saudi Arabia. When his bus was stopped at a check point, he discovered that he had left his Egyptian passport at the hotel. Questioned by the kingdom’s security forces, Saad asserted that he was Egyptian. “Egyptian, eh?” sneered the officer in charge. “Tell us a joke.” So Saad did, and the guards laughed heartily and sent him on his way. This story illustrates better than any assertion I could make the principle of the Egyptian character. 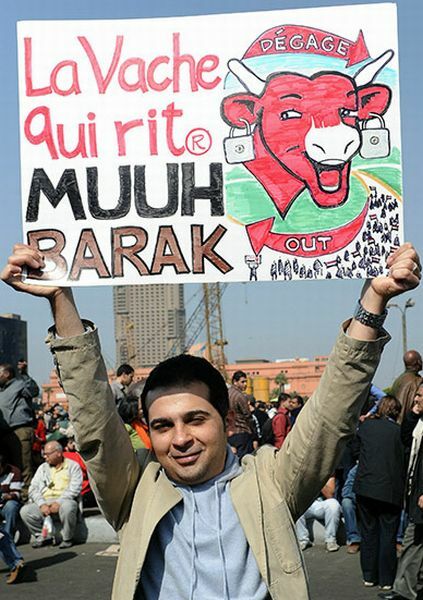 In regional stereotypes, Egyptians are usually seen as the funniest of the Arabs. They are said to be khafiift id-damm (light of blood). Ibn Khaldun, the great 14th-century Arab social theorist, noted that Egyptians were an unusually mirthful and irreverent people (Messiri :3). Her characterization echoes that of Ahmed Amin, who claimed that “in his day” (1900-1950) jokes were used as a way to deflect serious consideration of the potentially devastating consequences of social and economic changes. He described coffee houses filled with the most vulnerable populations, such as unemployed laborers, following the latest jokes as assiduously as they did the news or the latest cotton prices (Amin 1953). Amin thus ties Egyptian jocularity to news, economics and politics. Much of this character is expressed in everyday life in political satire–jokes about politicians, the police, the president, the military council, and other public figures. Or, as one recent article on political humor has it, such jokes are “’rhetorical charms,’ or stylistic seductions based on surprising uses of language and/or images designed to provoke laughter, disrupt ordinary arguments, and counter taken-for-granted truths” (Goodall et al 2012). A year ago, Michael Slackman suggested in a New York Times article that Egyptian humor was suffering from “revolution fatigue” (Slackman 2011). Perhaps that was briefly true for some of Mr. Slackman’s sources, but I think the Egyptian predilection toward humor as a tool in the face of pain, stress and difficulties remains very much cogent today, and is well-expressed in tweets, on television, YouTube, blogs and more. Amin, Ahmed. 1953. Fayd al-Khatir. Cairo. 10 vols. Ammar, Hamid. 1961. Growing Up in an Egyptian Village. London: Routledge and Kegan Paul. Messiri, Sawsan. Ibn al-balad: a concept of Egyptian identity. Slackman, Michael. 2011. When a Punch Line Is No Longer a Lifeline for Egyptians. New York Times, April 5.